Join fellow birders & educators as citizen scientists for Winter 2012 Operation RubyThroat expeditions to observe, capture & band hummingbirds in Belize, Nicaragua & Costa Rica. There's also a Costa Rica trip in Nov 2011. No experience necessary! We were honored the first weekend in April to give an after-dinner presentation for the Eastern Bird Banding Association, through which we have a life membership that was some of the best money we've ever spent. 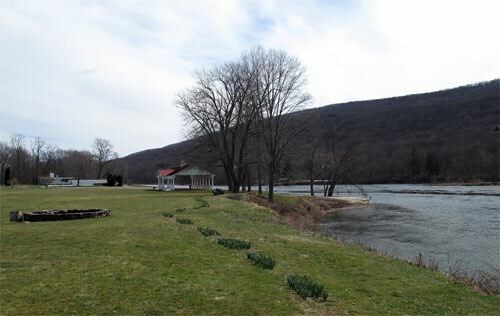 EBBA met on the banks of the Delaware River in eastern Pennsylvania's Pocono Mountains; lodging and programming were at historic Shawnee Inn, whose walls are covered with photos of famous guests from Sam Snead to Dwight Eisenhower to Jackie Gleason. The inn was once owned by Fred Waring, known for his "Pennsylvanians" big band and also for "inventing" the Waring Blender. (Waring's ties to the inn likely explain why muzak played over the in-house PA system included lots of songs from the 30s and 40s.) We were awed by the natural beauty of the setting and were pleased by the opportunity to share results of our Neotropical hummingbird research with some of the most accomplished bird banders in the country. When we weren't attending sessions by these esteemed colleagues we had some time to wander the grounds of Shawnee Inn. There were a few birds in evidence--a Ruffed Grouse drumming on the hillside was one highlight--but the river valley was mostly quiet. We noted a few piles of snow left over from what had been a very long and white winter and observed that "green-up" of trees and other vegetation was scarcely under way (top photo). This scene was much different from what we saw when we got back to Hilton Pond Center and encountered numerous "Signs of Middle Spring 2011." Indeed, by 1 April much of the Carolina Piedmont is well past green-up as the first sign of spring, and we estimate the southern Poconos of Pennsylvania were at least three weeks behind what we saw here in York, South Carolina. Whereas trees around Shawnee Inn weren't showing much in the way of bud swell, the vast majority of deciduous species at Hilton Pond had already leafed out. Granted, some of those local leaves were still small and tender, but even the huge terminal buds of late-leafing Shagbark Hickory, Carya ovata, were beginning to open (above). Hickories have big compound leaves and coming out of the nearly opened bud in the photo are five delicate petioles--each with several leaflets that will lengthen significantly in coming days. As the bud opens completely, the thin, translucent sheath that protected the developing leaflets will wither and turn brown. Meanwhile the Shagbark Hickory leaflets themselves can get down to that all-important task of photosynthesis. Bud burst is triggered in part by day length, but ambient temperatures also can play a role; even if there's enough sunlight, cold weather may inhibit metabolic processes required for a bud to open. By middle spring, of course, temperatures around Hilton Pond in most years already have reached the 70s and 80s, so any "heat-dependent" organism by then has shaken off the winter chill and become active. 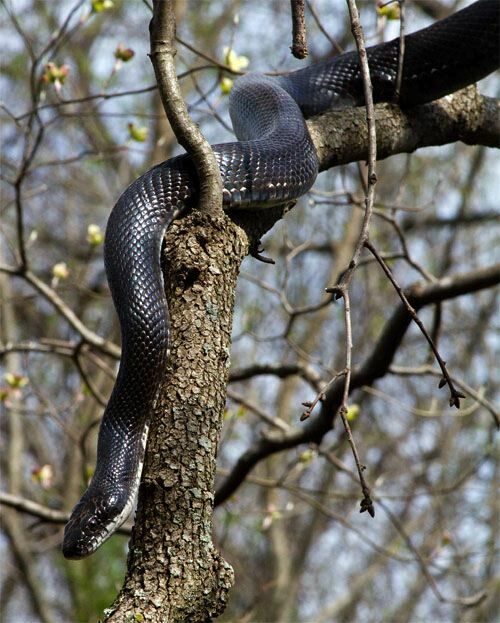 That was certainly the case this week when a healthy-looking six-foot-long snake slithered down the trunk of a Flowering Dogwood just outside our office window (above). We're not 100% positive but based on behavior and general markings we suspect this elongated reptile is none other than "Blackie"--the only wild animal we've ever named during all our years at the Center. 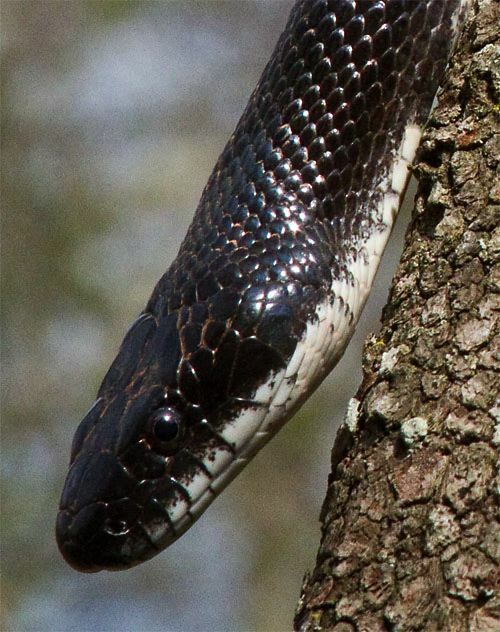 Blackie--an apparent male Black Ratsnake, Elaphe obsoleta--has been around for at least a decade and is noted for his frequent trips up and down the dogwood, in full view as we sit at the computer. Blackie spends part of his working day inside the attic of our old farmhouse, where he performs the valuable function of catching and eating mice that think THEY own the dwelling. The ever-hungry snake enters the attic through a small hole he accesses from the roof over the office and is welcome to come and go as he pleases. If this serpent really is Blackie, he's twice as big as he was when we first started observing his arboreal habit; furthermore, he looks very healthy and well-fed--which may explain all those shed snakeskins in the attic. Frequenting one of our sunflower tube feeders this week is a second black creature that likewise indicated we're in the midst of "middle spring." We speak here of a male Red-winged Blackbird (below right, in a photo taken through two layers of glass). This species might seem common and even undesirable to some observers but it's an infrequent local visitor at Hilton Pond Center. In 30 years we've banded only 24 red-wings and we almost never see one around the Center during the breeding season. 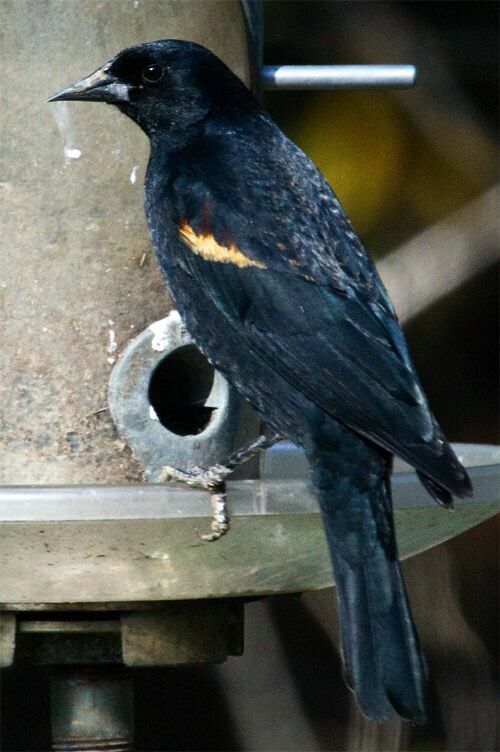 This seems a little odd in that some ornithologists consider Red-winged Blackbirds to be North America's most abundant bird--one that occurs in huge flocks with Common Grackles and other icterids in the Southeast during winter. Red-wings are omnivorous and in addition to taking his fill of sunflower seeds the bird in the photo appears to be spending time probing the margins of Hilton Pond--see the mud on his upper mandible--perhaps in search of snails and tadpoles and macroinvertebrates. What's really exciting about this red-wing is he has staked out a shrubby area at the north end of the pond where he has a couple of singing perches. We find it delightful this spring to hear the sound of "konk-a-reeee" several times a minute. We have high hopes our highly vocal Red-winged Blackbird will attract a female--or two or three--and breed on the property in 2011. All winter we gaze out the kitchen winter at Hilton Pond Center at a dead Eastern Red Cedar that serves as a perch for birds as they fly to and from our feeding station. Growing on the snag is a scraggly, tan-colored vine that by middle spring simultaneously puts out perfoliate leaves and brilliant red tubular flowers that--as one might suppose--provide nectar for Ruby-throated Hummingbirds who arrive "early." 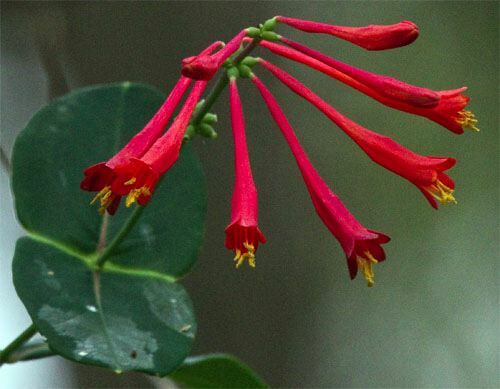 This is Trumpet Honeysuckle, Lonicera sempervirens (above), a native plant whose flowering period begins by the first of April and runs through June--sometimes with a second bloom in late summer. We're particularly fond of this little two-inch blossom--not just because it's a hummingbird attractant but because we enjoy its deep red color against the myriad shades of green found on middle spring foliage. Another sign that winter is on the wane and spring is fully underway is a drop in numbers of local Pine Siskins--this at the same time big flocks of American Goldfinches have swarmed in to replace them. Unlike two months ago, a look this week at the ground beneath our big sunflower seed feeders revealed dozens of goldfinches and just a few siskins (above). In fact, our banding ratio this week was 171 goldfinches to 13 siskins--a noticeable change from last week's 41:38 ratio but a big flip-flop from 15-18 February when we had 32 goldfinches overwhelmed by 89 siskins. As spring progresses all our Pine Siskins and most American Goldfinches will be leaving for more northerly breeding grounds, but if summer results from the past few years are an indication then ever-larger numbers of goldfinch pairs will stay to breed. We just wonder where this influx of goldfinches that showed up recently has been all winter. Another sign of middle spring here in the Carolina Piedmont is that male goldfinches have just about completed their molt into breeding plumage, and even their prospective mates are much brighter; the adult female in the photo above still bears a few drab winter feathers but is far more yellow than in December. 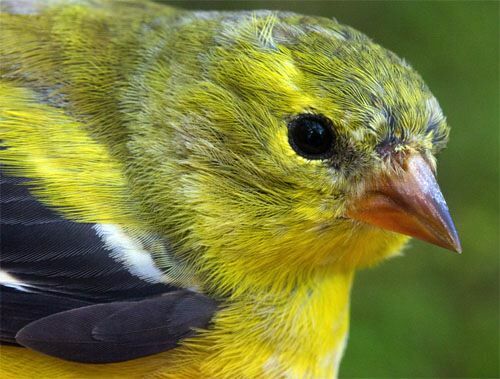 This particular American Goldfinch is of special interest because when we caught her this week on 8 April she became our 56,000th bird banded since 1982 at Hilton Pond Center, which is a LOT of birds. 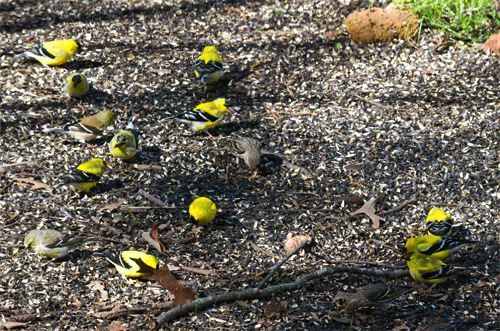 Incidentally, a few days before that (5 April) American Goldfinches became the second species to join Hilton Pond Center's elite "8,000 Club" of banded birds--second only to 8,439 House Finches (which have declined significantly the past several years). Since 1982 we've averaged 269 banded goldfinches annually, with a record high of 838 in 2007. We find it interesting that 81% of our American Goldfinches have been caught during the first six months of the year. Early spring wildflowers often are those that bloom in deep woods where there's protection from the elements but leafless trees aren't yet blocking sunlight from reaching the forest floor. By middle spring, however, the canopy is already casting shade on woodland flora that can't garner enough light to photosynthesize. Thus, one sure indication middle spring has arrived is when flowers begin blooming along roadsides that bask in full sun. One of the first of these this year has been Common Cornflower or Wild Bachelor's Button, Centaurea cyanus (above), an annual non-native from Europe that now grows across North America. 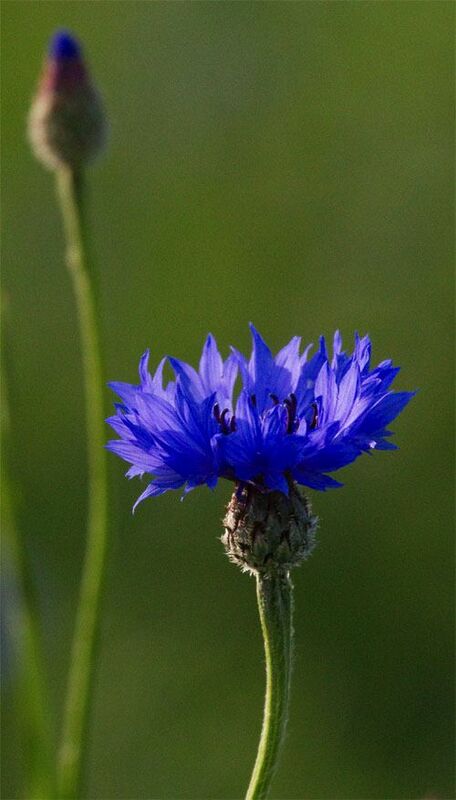 Oddly enough, because of herbicide abuse and intensive farming Common Cornflower is considered an endangered species in its native England, where it now grows naturally at only three sites. Like many roadside, sun-loving blossoms Cornflower is in the Composite Family (Asteraceae), with sterile ray flowers surrounding a center of fertile disc flowers. Each flower head can produce dozens of seeds that have a high germination rate in disturbed areas and freshly plowed ground, hence its frequent occurrence in corn fields--a habitat that gave rise to the plant's common name. Non-native Common Cornflower is often confused with non-native Common Chicory--which also grows as a roadside weed in the Carolinas and beyond--but the former has a dark flower center. Blackbirds and blacksnakes, goldfinches and siskins, honeysuckle and cornflower . . . if what we've been observing at Hilton Pond Center is any indication, things happen fast in the natural world during April. All this is too good to ignore, so our advice is to get outside as often as you may for as long as you can to witness your own "Signs of Middle Spring 2011." "This Week at Hilton Pond" is written & photographed by Bill Hilton Jr., executive director of Hilton Pond Center for Piedmont Natural History. Thanks to the following fine folks for recent gifts in support of Hilton Pond Center for Piedmont Natural History and/or Operation RubyThroat: The Hummingbird Project. Your tax-deductible contributions allow us to continue writing, photographing, and sharing "This Week at Hilton Pond." Please see Support if you'd like to make a gift of your own. If you like shopping on-line please become a member of iGive, through which 800+ on-line stores from Amazon to Lands' End and even iTunes donate a percentage of your purchase price to support Hilton Pond Center . Every new member who registers with iGive and makes a purchase earns an ADDITIONAL $5 for the Center. You can even do Web searches through iGive and earn a penny per search--sometimes TWO--for the cause! Please enroll by going to the iGive Web site. It's a painless, important way for YOU to support our on-going work in conservation, education, and research. Add the iGive Toolbar to your browser and register Operation RubyThroat as your preferred charity to make it even easier to help Hilton Pond Center when you shop. Operation RubyThroat has teamed with EarthTrek so citizen scientists--like YOU--can contribute observations about hummingbird migration and nesting behavior. Membership is free for this great new opportunity to help increase scientific understanding of Ruby-throated Hummingbirds. Data entry forms for 2010-11 are on-line, so please register today at EarthTrek. NOW is the time to report your 2010 RTHU fall departure dates for the U.S. & Canada, and fall arrival dates for Mexico & Central America. --Overnight storms on 4 Apr played havoc with the surrounding community, but there was no significant damage to vegetation, wildlife, dwellings, or people at Hilton Pond Center. We did go without power for two full days, however, a bit of an inconvenience when an electric pump motor provides the water supply. Having survived Hurricane Hugo--when power was off for a full week--we're always careful to hold numerous gallon jugs of drinking water in reserve on the top shelf of the pantry. The best thing about not having electricity was that the house was exceptionally quiet and we could see the night sky without light pollution from the neighborhood glut of outdoor lighting. We kinda liked the outage and just need to remember to go out and buy replacement oil for our antique hurricane lamps that always see us through the darkness. The good news is that after two big storms in the past ten days Hilton Pond is about 6" deeper than it was a week ago, even though it's still a foot below maximum. --In case you're wondering, the Center dodged a bullet on the afternoon of 9 Apr when another line of strong thunderstorms barreled through the region but caused no damage locally. Son Garry Hilton wasn't so lucky; his car--parked at Fort Mill High School on the east side of York County--lost its rear window and windshield to baseball-sized hailstones. Ouch! Hilton Pond Center for Piedmont Natural History is a non-profit research, conservation & education organization in York, South Carolina USA; phone (803) 684-5852. Directed by Bill Hilton Jr., aka "The Piedmont Naturalist," it is parent organization for Operation RubyThroat. Web site contents--including text and photos--may NOT be duplicated, modified, or used in any way except with express written permission of Hilton Pond Center. All rights reserved worldwide. To request permission for use or for further assistance, please contact Webmaster.